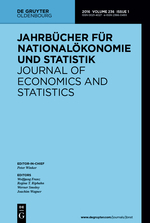 The Journal of Economics and Statistics (Jahrbücher für Nationalökonomie und Statistik) is a scientific journal published in Germany since 1863, since 2016 by De Gruyter Oldenbourg. Please find additional information as well as all volumes, issues and abstracts on the publishers page of the Journal of Economics and Statistics. More information on the integration of the Lucius & Lucius portfolio at De Gruyter Oldenbourg. The Journal of Economics and Statistics publishes papers in all fields of economics and applied statistics. A specific focus is on papers combining theory with empirical analyses. Papers providing conclusions for economic policy in Europe are particularly welcome. Nevertheless, distinguished papers dealing exlusively with economic theory, empirical models, or economic history, will not be excluded from consideration. The editors invite replication studies focusing on the robustness of empirical findings. The section Data Observer presents articles on data sets available for empirical research and institutions providing research data. The journal also publishes special issues, short comments, and book reviews. Since January 2016, the Journal of Economics and Statistics comprises a new section "Data Observer" for free download at Inhalte/Data observer. The papers in this section describe datasets available for empirical research and provide details on how to obtain access to these datasets for research. The Journal of Economics and Statistics will provide free online access to up to three papers each year. The selection of these papers is made by the editorial board based on scientific quality, originality and potential interest for a broad readership. - Bug, Mathias, Stefan Liebig, Claudia Oellers und Regina T. Riphahn: Operative und strategische Elemente einer leistungsfähigen Forschungsdateninfrastruktur in den Sozial- und Wirtschaftswissenschaften, 238,6, 2018, 571-590.